Although the 360 has pretty much looked the same since its launch, Microsoft has actually changed the core a few times and the latest chipset is code named Jasper. To you and me what this really means is that it works just like the older 360 but with less power, noise and fewer incidents of RRoD — in theory. 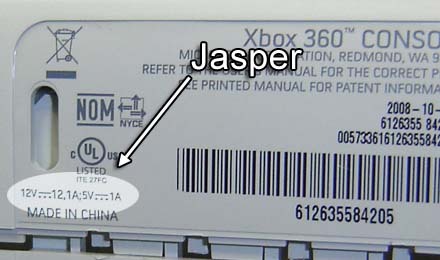 Since the Jasper model looks identical to the older 360 you have to know what to look for to tell you have/are buying one. There are a few ways to identify it, but the most dependable is to look at the power requirements, which are printed on the serial number sticker on the back. While the older models required 14.2 amps, the Jasper only draws 12.1 amps. 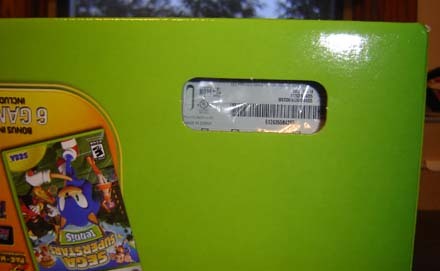 Now the great news is that you can actually see this sticker without opening the box by looking through the hole for the barcode sticker. First look through this hole. 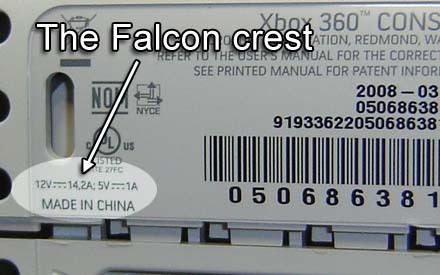 This is a falcon, notice it is labeled 14.2 amps. This is the Jasper, it is labeled 12.1 amps. These pictures were from an older Engadget post. According to my kill-a-watt, the Jasper 360 only uses 90 watts while in Media Center mode, while the Falcon uses about 108. It is noticeably quieter than the Falcon as well, but still not silent enough to be in my home theater. The PSU makes some of the noise and the Jasper will work with the older PSU or a newer one (the newer one won’t work on the Falcon). Not sure if there is any way to tell which PSU is included when you buy it, but the one I bought had the older style PSU. I’ll be honest. Part of the reason I wrote this was because I went looking for this information today and couldn’t easily find it via Google. So I figured I’d Google juice the title and drive traffic while at the same time help those in need find this information. And besides, it’s been way to long since I wrote anything here.